A dolphin now known as Sandy Salmon was the first successful live stranded bottlenose dolphin in Ireland has been recorded with its calf. The female dolphin stranded on 1 June 2012 on Béal Beach in Co. Kerry. She was in good health when she stranded and it seemed she had been feeding on salmon and had been stranded by a fast outgoing spring tide. She was refloated although the prognosis for live stranded bottlenose dolphins was not thought to be good. 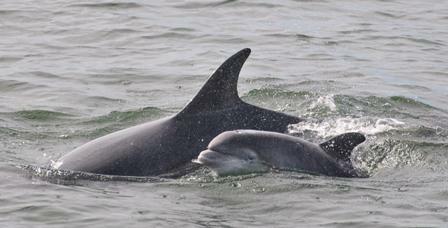 Sandy Salmon was recorded by dolphin researchers conducting a monitoring survey from a tour boat in the Shannon Estuary on 27 June 2012. She was seen again many times over last summer in different groups of dolphins until the last sighting of her at the end of the summer field season on 8 September 2012, exactly 100 days after the date of her stranding. Remarkably, on this date, she was seen with a newborn calf. The bottlenose dolphin has a gestation period of 12 months, so if this was indeed her calf, she would have been around 9 months pregnant at the time of her stranding and subsequent rescue. However we were not 100% sure it was her calf. We are delighted to announce that Sandy Salmon has been recorded again this year! She has been seen on three research trips so far, on 1 May, 21 June and 24 June – and her calf has been seen with her each time! We can now say without a doubt that this dolphin was pregnant and both mother and unborn calf were successfully refloated and thus saved that day back in June 2012. 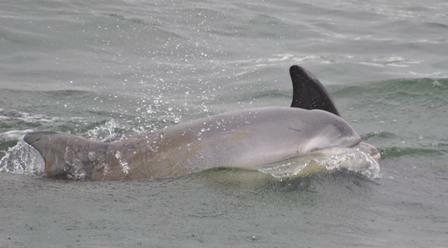 Shannon Dolphin and Wildlife Foundation researchers will continue to monitor Sandy Salmon and her calf by joining commercial dolphin-watching trips out of Kilrush and Carrigaholt and by conducting surveys throughout the Shannon Estuary. We are hopeful that we will be able to track the development of this calf from its early days into adulthood, the first time that this type of important life history research will have been carried out in Ireland. Keep up to date with news of Sandy Salmon and her calf, and all of the other resident individuals living in the Shannon Estuary on our website www.shannondolphins.ie and our new Facebook page for the Shannon Dolphin and Wildlife Centre! The Shannon Dolphin Study is celebrating 20 years of study and talks and guided dolphin-watching will be organised throughout the summer.